Loading..Is the Supermoon responsible for record low Polar ice formation? Loading..What is the Greenhouse Effect? Is the Supermoon responsible for record low Polar ice formation? The "Supermoon" on November 14th coincided with the closest (perigean) approach to the earth of the moon since 1948. Tidal forces are inversely proportional to the cube of distance. Full moon occurs when the sun lines up with the moon and November 14th is close to the perigee of the earth's orbit round the sun. This combined to produce strong tides. At full moon in November the moon lies in the southern hemisphere . So for the Arctic it is the opposite facing tides that is strongest while for the Antarctic it is the direct lunar facing tide that dominates. They are symmetric. Here are my calculations of the tractional acceleration at different latitude covering November, based on the JPL ephemeris. The tractional tidal force acting at 45N (green) and 75N (blue). Polar regions experience far greater tidal ranges during the lunar month than temperature regions. The Supermoon amplified this effect by about 20%. This enhanced tidal mixing and has probably inhibited ice formation since early October. It is the tidal range that is maximised during a perigean spring tide. That is the difference between low and high tides. At high latitudes this effect is magnified as just one tide dominates and neap tides effectively disappear completely. This gives an extreme varying monthly tidal range. Tides act throughout the ocean, dragging both deep and shallow water alike. This increasing churning tidal flow since October has had two effects. First it has inhibited natural sea ice formation, and secondly mixed in more warmer water from lower latitudes than normal. These large tidal ranges look likely to continue till the end of 2016 before returning to normal. The Arctic ocean also has relatively shallow basins with narrow channels at the Bering Sea and to the North Atlantic between Iceland-Scandinavia. This accentuates tidal flow. Thanks to @Kata_basis for prompting me to look into this ! This week, this remarkable plot began blowing up on social media. The plot tracks global sea ice abundance – a combined measurement of the area covered by ice in both the Arctic and Antarctic. The red line, 2016, shows that Sea Ice extents globally are by far the lowest humans have ever recorded. Normally at this time of year, Arctic Sea ice is beginning to recover from low volumes reached during the summer, while Antarctic Sea ice is beginning to contract as sunlight falls on that continent. On top of this yearly variation there have been several long-term trends imposed. Most notably, sea ice extents have been decreasing in the Arctic quite regularly for the last 30+ years – the time humans have been actively monitoring sea ice. The lowest ever extent of sea ice was reached at the end of summer 2012, but that doesn't mean the sea ice has been recovering – instead, years since then have seen record low sea ice values "for specific months". In other words, the long-term trend is gradually decreasing sea ice due to climate change, and records at any time of the year are being broken when a perfect weather pattern hits. One of those weather patterns is hitting in the Arctic right now. The North Pole right now is already shadowed for the winter. Usually this darkness is associated with plummeting temperatures since no heat from the sun can warm it, but for the past month there have been several times when North Pole temperatures have spiked above the freezing point of water; as much as 15°C above normal for this time of year. These temperatures are being driven by surges of warm air traveling up to the poles from lower latitudes. Although this effect isn't fully understood yet, warm winter arctic weather combined with surges of colder air traveling south has been a feature of the last several northern hemisphere winters. It has been proposed that these surges are associated with weakening of the jet streams as climate warms – weaken the jet streams, the boundaries between different convection cells in the atmosphere, and it becomes easier for warm air to be pushed all the way up to the poles. So far this fall Siberia has been anomalously cold while the North Pole has been anomalously warm, consistent with this mechanism. This warm air preventing ice growth also is combining with the low summer sea ice extent. Sea ice is bright and open water is dark, so when sea ice melts the water beneath will store more heat during the summer. 2016 had the 2nd lowest summer sea ice extent observed in the Arctic, so the Arctic Ocean waters are also warmer now than was typical before humans increased greenhouse gas concentrations in the atmosphere. Meanwhile, the real puzzle this year is the Antarctic. Sea ice in Antarctic has actually been increasing the last few years – a reminder that the Antarctic is a fundamentally different area than the Arctic. In the Antarctic, the presence of the ozone hole has driven more intense winds that have cooled surface waters and helped the formation of Antarctic sea ice. Furthermore, melting on the Antarctic continent has created a supply of fresh water heading into the oceans and fresh water freezes at higher temperature than salty water. Recent work has suggested this could only be a temporary situation – healing of the ozone hole (actually good!) could remove one of the factors protecting Antarctic Sea Ice, and another major factor could be extra warm water at depth. Several recent studies have suggested that Antarctic Sea Ice could be particularly vulnerable to extra warmth in the subsurface – add a bit of extra heat and that ice retreats rapidly. Right now, there is likely less sea ice on Earth at this time of year than there has been in about a hundred thousand years – going back to before the last cycle of glacial advance. 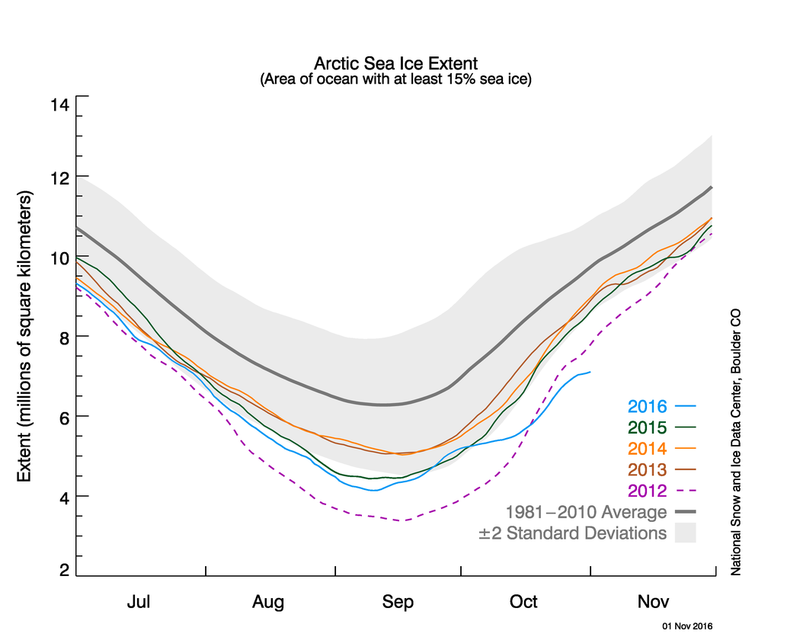 The downward trend, particularly in the Arctic, is extremely likely to continue in future years. It won't always produce an all-time low in September - that takes the perfect weather conditions at the perfect time of year – but when the right weather conditions do show up we'll get record lows for that time of year. Whether this year's rapid sea ice melting in Antarctica will be a one-time event is, as of now, an extremely important question with no good answer. Sea ice in these areas represents a habitat for many organisms – a stable place where they can rest before heading out into the ocean. As sea ice extents fluctuate, these species are put under increasing threat. Furthermore, the more open ocean there is, the more heat the oceans can take up – so these drops in sea ice can contribute to warming the surrounding oceans and thus put continental ice sheets under even greater stress. Some scientists have been debating whether it is good communication to place all the Earth's sea ice on one chart when both poles are two distinct systems, but the threat to wildlife globally and the effect of warming oceans may represent reasonable worries based on this plot alone. "동짓날부터 3일 동안 남동풍이 불 것입니다. 화공(火攻)을 이용하면 적을 퇴치할 수 있습니다." 서기 208년, 조조의 80만 대군과 결전을 앞둔 유비에게 제갈공명은 신께 빌어 북서풍을 남동풍으로 바꾸겠다고 말했다. 유비의 부대는 불과 10만명. 남동쪽에 자리 잡은 유비는 북서풍이 부는 상황에서 불을 쓸 수 없었다. 불을 사용했다가 맞바람을 맞아 아군이 피해를 입을 수 있기 때문이다. 하지만 제갈공명의 예언은 적중했다. 음력 11월 20일부터 3일 동안 북서풍이 남동풍으로 바뀌었고, 조조의 대군은 쏟아지는 불화살에 궤멸당했다. 제갈공명의 기도에 온 우주가 나서서 도와준 것일까. 기상학자들은 제갈공명이 과거 바람의 기록을 토대로 남동풍이 불 것을 예측한 것으로 보고 있다. 겨울이 머지않았다. 매해 겨울 예상치 못한 추위가 찾아와 기상청의 예보를 무색하게 했다. 올겨울은 어떨까. 동아시아 지역의 겨울 날씨에 영향을 주는 요인을 토대로 겨울 날씨를 예측해봤다. 제갈공명처럼 정확한 예측은 어렵지만 어느 정도 예상은 할 수 있다. 결론부터 말하면 올겨울 날씨, 심상치 않다. 2012년 2월 한반도가 꽁꽁 얼었다. 2월 2일 서울 영하 17도, 철원 영하 24도 등 갑작스러운 혹한이 찾아왔다. 이는 2013년도에 이어 2014년, 2015년에도 이어졌다. 전문가들은 갑작스레 찾아온 한파의 원인을 '북극진동지수'에서 찾는다. 북극진동지수란 1998년 존 월리스 미국 워싱턴대 교수가 개발한 값으로 북반구 북위 60도 이상의 고위도와 중위도의 해면기압(기압은 관측하는 장소의 높이에 따라 달라지므로 관측 지점에서 얻은 기압을 해수면상에서의 기압 값으로 바꿔 계산한 것으로 통상 약 9m 하강할 때마다 1hPa을 올린다) 차이를 의미한다. 북극진동지수는 '0'을 기준으로 -5~+5 사이의 값으로 표현된다. 만약 북극 기온이 올라가면 기압도 올라가지만 중위도 지방의 기압은 낮아진다. 북극진동지수는 이 상태를 '음(-)'으로 표기한다. 북극진동지수가 음의 값을 띠며 약해지면 북극에 존재하는 영하 60~70도의 찬 공기를 막고 있는 제트기류도 덩달아 약해지면서 한반도 지역으로 찬 공기가 이동해 예상치 못한 한파가 들이닥친다. 미국 국립해양대기국(NOAA) 기후예측센터에 따르면 북극진동지수는 10월 들어서면서 떨어졌다가 11월 16일 현재 양의 값을 기록했다. 하지만 안심할 수 없다. 김백민 극지연구소 선임연구원은 "북극진동지수 값은 굉장히 민감하기 때문에 일시적인 상태 값만으로 겨울 날씨를 예측하는 것은 한계가 있다"며 "올해 유독 북극진동지수는 음의 값을 계속해서 유지하고 있었던 만큼 일시적으로 양의 값을 회복한 것인지 지켜볼 필요가 있다"고 말했다. 현재 북극진동지수 값을 갖고 올겨울 날씨를 성급하게 예측할 수 없지만 전반적으로 음의 값을 유지할 가능성이 큰 만큼 초겨울 예상치 못한 한파가 올 수 있다. 북극 빙하 면적도 한반도 겨울에 영향을 미친다. 빙하가 녹으면 북쪽 공기의 상층부와 하층부 간 기온차가 작아진다. 결국 앞서 이야기한 북극진동을 약화시키는 결과를 낳는다. 북극에 있는 차가운 공기가 동아시아 지역으로 밀려 들어와 한파는 물론 폭설까지 일으킬 수 있다. 미국 국립빙설자료센터 자료에 따르면 2016년 10~11월 북극 빙하 면적은 빙하 면적이 가장 줄었던 2012년보다 더 줄어든 것으로 나타났다. 올여름 지구가 가장 뜨거웠던 만큼 빙하 면적도 많이 줄어든 것이다. 김백민 선임연구원은 "빙하 면적의 감소는 초겨울 예상치 못한 추위를 일으킬 수 있다"고 말했다. 지구에서 가장 추운 지역으로 꼽히는 시베리아. 시베리아에 쌓인 눈의 양은 동아시아는 물론 미국과 유럽 등 전 세계에 영향을 미치는 것으로 나타나고 있다. 하얀 눈은 햇빛의 70~80%를 반사해 우주로 되돌려보낸다. 반대로 눈이 덮이지 않은 땅은 20% 정도만을 반사한다. 눈이 많이 쌓일수록 햇빛이 반사되면서 땅의 온도는 점점 떨어지고 공기는 차가워진다. 차가워진 공기 덩어리가 이동하면서 한파가 찾아온다. 올해 시베리아 지역은 겨울이 빨리 시작됐다. 상당히 많은 눈이 내렸기 때문이다. 10월 눈이 덮인 시베리아 면적은 약 1500만㎢. 1968년 관측 이후 세 번째로 많은 눈이 쏟아졌다. 알래스카를 포함한 미국 전체 대륙보다도 넓다. 시베리아 지역에서 만들어진 찬 공기는 미국뿐 아니라 동아시아 지역까지 이동하며 예상치 못한 한파를 일으킨다. 북쪽에서 만들어진 차가운 공기는 남쪽에서 올라오는 따듯한 공기와 만나면서 폭설을 일으킬 가능성도 있다. 주다 코언 미국 매사추세츠공대(MIT) 교수는 "시베리아 지역에 쌓인 눈은 초겨울은 물론 겨울 중반부까지도 영향을 미치는 것으로 나타났다"고 말했다. 지난해 겨울 미국과 유럽 등에서 발생한 이례적인 폭설도 시베리아 지역에 많이 쌓인 눈이 원인이라는 분석이 나오고 있다. 올겨울은 '라니냐'까지 한반도에 영향을 미칠 가능성도 있다. 일반적으로 라니냐가 나타나면 한반도의 겨울 기온은 떨어진다. 라니냐는 동태평양의 적도 지역에서 해수면 온도가 평년보다 0.5도 이상 낮은 저수온 현상이 5개월 이상 일어나 생기는 이상 현상을 말한다. 라니냐로 인해 북서태평양 지역에 저기압이 형성되면 상승기류가 형성되면서 반대로 남북 방향으로 하강기류가 만들어진다. 김선태 APEC기후센터 기후연구팀장은 "라니냐가 발생하면 남북 방향에 있는 시베리아 쪽에 하강기류가 발달한다"며 "시베리아 고기압이 강화돼 찬바람이 한반도로 불어온다"고 설명했다. 현재 기상청은 물론 전 세계 여러 기상 관련 기관들은 올겨울 라니냐가 지속될 확률을 50%로 보고 있다. 김선태 팀장은 "지난여름 유독 더웠던 날씨 등 계속되는 기상이변이 한반도 기후에 어떤 영향을 미치는지에 대한 추가 분석이 필요하다"고 말했다. "현재 추세면 35년 뒤 무너질 수도"
"진짜 위험한 건 온도 상승의 속도"
environment_기후변화 대응의 당위성을 이야기하는 글에 빠지지 않는 것이 '미래세대에 대한 책임'이라는 식의 표현이다. 사람들이 '기후변화는 인류 최대 위협'이라는 말에 고개를 끄덕이면서 우선 떠올리는 '인류'는 자신과는 먼 미래 사람들이다. 과학자들의 연구 결과는 이런 생각이 틀렸을 수 있다고 말한다. 기후변화 시계가 예상보다 빨리 돌아가면서 미래가 현재로 더 빨리 끌어당겨지고 있기 때문이다. 북아프리카 모로코의 마라케시에서는 7일 세계 190여개 나라가 참여하는 유엔 기후회의가 개막된다. 1995년부터 해마다 지구촌 공동의 과제인 기후변화 대처 방안을 논의해온 중요한 회의다. 18일까지 이어지는 올해 회의에서는 1992년 채택된 유엔기후변화협약의 당사국회의(COP22), 1997년 채택된 교토의정서 당사국회의(CMP12)와 함께 4일 발효된 파리협정의 당사국회의(CMA1)도 열린다. 기후변화협약과 교토의정서는 주요 당사국들이 비준을 미루는 바람에 채택하고 3년, 8년이 흐른 뒤에야 첫 당사국회의를 할 수 있었다. 반면 파리협정은 미국, 중국, 인도 등 온실가스 배출량이 많은 나라가 적극 비준에 나서면서 지난해 12월 채택되고 만 1년도 안 돼 첫 당사국회의를 열 수 있게 됐다. 2020년 만료되는 교토의정서 체제 후속 기후체제를 열어줄 파리협정이 예상보다 일찍 국제법적 효력을 갖게 되자 유엔기후변화협약 사무국에서는 고무된 분위기의 보도자료를 내놨다. 파리협정은 "지구 평균온도를 산업화 이전 온도에서 2도 훨씬 못 미치게 증가하는 정도로 억제하면서, 증가 폭을 1.5도까지 낮추기 위해 노력한다"고 천명했다. 24년 전 기후변화협약에서 "기후 시스템에 대한 인간의 위험한 개입을 예방하는 수준에서 온실가스 농도를 안정화한다"고 추상적으로 제시한 목표를 온도 상승폭으로 구체화한 것이다. 2도 억제 목표에 덧붙여 1.5도를 추구해야 할 억제선으로 추가한 것은 2도 상승한 세계가 생각보다 더 위험할 수 있다는 데 국제사회가 합의했기 때문이다. 파리협정이 내건 온난화 억제 목표는 그러나 이미 진행된 온난화 수준과 지구 전체 온실가스 감축 계획으로 미뤄볼 때 달성되기 극히 어려울 것이란 진단이 지배적이다. 대기화학자인 영국의 로버트 왓슨을 비롯한 6개국의 대표적인 기후변화 전문가 7명이 9월말 내놓은 <기후변화에 대한 진실>이라는 보고서의 결론도 마찬가지다. 이런 부류의 글은 그동안 없지 않았다. 하지만 이 보고서는 주저자인 왓슨이 국제사회에 기후변화 논의의 기초 자료를 제공하는 기후변화정부간협의체(IPCC) 의장까지 지낸 저명한 과학자라는 점에서 주목할 만하다. 이들은 보고서에서 "산업화 이전 대비 지구 온도 상승 폭을 1.5도에서 억제하는 목표는 이미 거의 확실히 빗나갔고, 2도 억제선도 2050년이면 도달할 수 있다"고 밝혔다. 지구 온도는 지난해까지 이미 산업화 이전 대비 1도 상승했다. 이런 상태에서 이미 배출된 온실가스에 의해서만 0.4~0.5도의 추가 상승이 예상되는 반면, 각 나라의 온실가스 감축 속도는 충분히 빠르지 않다는 게 그런 판단의 근거다. 보고서는 또 모든 나라가 국제사회에 약속한 온실가스 감축 계획(INDC)을 100% 이행해도, 2030년에 대기 중에 배출될 온실가스는 2도 억제선을 넘기지 않으면서 최대한 배출할 수 있는 양보다 33% 많을 것으로 분석했다. 게다가 80%가 넘는 나라가 감축 계획 실행을 선진국들이 연간 1000억달러 규모의 지원금을 내놓는 것과 조건부로 묶어 놓았다. 부족한 온실가스 감축 계획마저 이행되기까지 넘어야 할 산이 높은 셈이다. 2도 억제선 방어가 어렵다는 진단에는 유엔기구도 동의한다. 유엔환경계획(UNEP)은 <2015 배출량 격차 보고서>에서 지금까지 제시된 각 나라의 감축 계획대로면 세기말까지 지구 기온은 2도 억제선을 훨씬 뛰어넘어 3~3.5도까지 올라갈 수 있다고 지적했다. 기후변화정부간협의체의 온실가스 배출량 시나리오에서 2도선 억제 가능성이 큰 경로를 따르려면 2010년 475억tCO₂-eq(이산화탄소 환산 톤)인 세계 온실가스 배출량이 2020년 520억tCO₂-eq에서 정점을 찍고 이후 빠르게 줄어들어야 한다. 하지만 각 나라가 약속한 2030년까지의 감축 계획을 모두 이행해도 온실가스 배출량은 계속 늘어나, 2030년의 지구 온실가스 배출량은 2도 억제선을 지킬 수 있는 양보다 140억tCO₂-eq 많은 수준이 될 것이기 때문이다. 실제 관측 결과와 기후변화정부간협의체에서 제시한 시나리오를 비교해 보면 복잡한 분석을 하지 않고도 파리협정이 설정한 기후변화 억제 목표가 얼마나 무리한 것인지 쉽게 알 수 있다. 지난해 대기 중 온실가스 농도는 이산화탄소로 환산해 485ppm·CO₂-eq을 기록했다. 미국 국립해양대기청(NOAA)이 이산화탄소(CO₂)와 메탄(CH₄), 아산화질소(N₂O) 등 기후변화협약에 규정된 6가지 온실가스를 모두 측정해 분석한 결과다. 온실가스 농도 485ppm은 어느 수준일까? 기후변화정부간협의체는 <제5차 기후변화평가보고서>에서 미래 기후변화를 전망하는 데 4가지 온실가스 배출 대표농도경로(RCP) 시나리오를 사용했다. 이 가운데 지구 온도 상승을 산업화 이전 대비 2도 이내에서 억제할 '가능성이 높다'고 제시한 RCP2.6 시나리오의 2100년 대기 중 온실가스 농도는 평균 450ppm·CO₂-eq이다. 지구 온도가 이번 세기 이후에도 1850~1900년 대비 2도 이상 오르지 않을 '가능성이 있다'고 제시한 2100년의 대기 중 온실가스 농도는 평균 500ppm·CO₂-eq이다. 지구 온실가스 농도가 2도 상승 억제선을 넘지 않을 '가능성이 큰' 농도를 이미 넘어, 억제할 '가능성이 있는' 농도의 턱밑까지 다가간 셈이다. 기후변화정부간협의체가 결국 대기 중에 누적된 이산화탄소를 제거해 온실가스 농도를 다시 떨어뜨리는 이른바 '바이오에너지 탄소포집저장'(BECCS)과 같은 '지구공학' 방안을 2도 억제선 방어 수단으로 제안할 수밖에 없었던 이유다. 기후변화정부간협의체가 제안한 지구공학 기술은 언제 완성될지 기약이 없다. 또 가능해진다 해도 천문학적인 비용과 또 다른 환경 훼손 논란을 넘어야 한다. 지난달 르완다 몬트리올의정서 당사국회의에서 강력 온실가스인 수소불화탄소(HFCs)의 단계적 퇴출에 합의한 것도 그 효과가 알려졌던 만큼 크지는 않을 것이라는 분석에 무게가 실린다. 안병옥 기후변화행동연구소장은 "수소불화탄소 감축으로 온실가스 배출량이 전체 온실가스 연간 배출량의 2배에 이를 수 있다는 계산까지 제시된 것으로 보아 그 자체로 작은 효과는 아니겠지만, 그것은 현재 추세로 계속 배출할 경우와 대비해 그렇다는 것이고, 그에 따른 감축도 대부분의 나라가 이미 약속한 온실가스 감축계획(INDC)에 포함돼 있다고 봐야 한다"고 말했다. 수소불화탄소가 이미 각 나라들이 감축 실적에 포함해온 온실가스의 하나여서 추가 감축될 가능성이 크지 않다는 얘기다. 유엔기후변화협약사무국에 제출된 각 나라의 감축 계획을 보면, 주요 온실가스 배출국 가운데 수소불화탄소를 제외하고 이산화탄소만 감축 기준으로 삼은 나라는 중국뿐이다. 지구는 평균기온이 산업화 이전 대비 1도 상승한 상태에서 이미 다양한 기후변화 피해를 경험하고 있다. 지구촌 곳곳이 돌아가며 폭염과 열파와 같은 극한 현상에 시달리고, 관측 기록을 깨는 집중 호우에 따른 홍수와 가뭄으로 농작물 생산과 경제활동에 큰 피해를 보고 있다. 변화에 적응하지 못하는 생물종들은 점점 멸종 위기를 향해 가고, 병원체나 모기와 같은 질병을 매개하는 해충의 서식지와 활동 기간이 늘어나면서 전염병 위험 지역이 확대되고 있다. 극지의 얼음이 녹아 해수면이 올라가면서 작은 섬나라와 해안 저지대에는 상습적인 침수와 폭풍 해일 등의 위험에 노출돼, 기후난민까지 나타나고 있다. 여기에서 다시 1도가 더 올라가 산업화 이전 대비 2도 상승한 세계는 인류가 한 번도 경험해보지 못한 미지의 세상이다. 게다가 그것이 지금 살아 있는 사람 대부분이 떠난 뒤일 세기말이 아니라 불과 35년 뒤인 2050년으로 확 앞당겨 도착한다면 어떤 모습일까? 기후변화 전문가들은 그 세상이 산업화 이후 지금까지 1도 상승하는 동안 나타났던 기후변화 정도가 딱 1도만큼만 더 심해지고 마는 세상은 아닐 것이라고 설명한다. 산업화 이전 대비 지구 평균기온이 0.5도 올라간 상태에서 0.5도 더 증가하는 것과 1도나 1.5도에 도달한 상태에서 다시 0.5도 올라가는 것은 모두 같은 0.5도의 온도 변화지만, 그 영향은 뒤로 갈수록 더 강하게 나타날 수 있다는 이야기다. 민승기 포스텍 환경공학과 교수는 "온난화 영향 가운데서도 폭염이나 열파 같은 이상 기상현상은 특히 더 선형이 아니라 비선형으로 증가하는 경향이 있다. 온도가 증가하는 데 따라 직선으로 증가하는 것이 아니라 지수함수적으로 급격하게 증가하는 것이다. 극지에 있는 얼음도 온도 증가와 같은 속도로 천천히 녹는 것이 아니라 갑자기 빠르게 녹는 순간이 올 수 있는데 최근 그렇게 갑자기 점프하듯 비선형으로 속도가 빨라지는 구간이 산업화 이전 대비 상승 폭 1.5도와 2도 사이에 있다는 보고들이 나오고 있다"고 말했다. 더욱 우려스런 것은 전례 없이 빠른 온도 증가 속도다. 민 교수는 "산업화 이전 대비 2도라는 온도의 크기도 중요하지만, 그 온도가 얼마나 짧은 시간에 변하는가가 영향 측면에서는 훨씬 중요한 질문이다. 빙하기와 간빙기의 지구 평균온도 차이가 5도밖에 안 되고, 그것도 10만년이란 기한을 두고 천천히 왔다갔다해 생태계가 적응할 시간이 충분했다. 그러나 100년에 1도가 증가하게 되면 이 속도가 100배 빨라지는 것인데, 그렇게 되면 생태계가 적응하기 어려울 수 있다"고 말했다. 로버트 왓슨 교수 등의 보고서대로 35년 만에 1도 증가하는 속도가 현실화될 경우 지금까지의 기후변화 속도에 힘들게 적응해온 생물종들이 어떤 처지에 놓일지 짐작하기 어렵지 않다. 1988년 미국 의회 청문회에서 처음 온실가스에 의한 기후변화의 위험성을 증언한 것으로 유명한 제임스 핸슨 박사가 이끄는 19명의 국제 연구팀이 지난 5월 과학저널 <대기화학과 물리학>에 발표한 연구 결과는 기후변화의 영향이 지수함수적으로 급격히 증폭되는 것을 잡아낸 사례다. 연구자들은 실제 관측 자료와 수치 기후 모델, 고기후 자료 등을 이용해 그린란드와 남극에서 점점 바다로 많이 녹아들고 있는 얼음물이 바닷물 순환을 억제해 해수 표면 온도를 증가시키고, 이것이 다시 해빙을 증가시키는 되먹임(피드백) 과정이 증폭되기 시작했다는 놀라운 결론을 얻었다. 이들은 그 되먹임 과정이 지금보다 평균온도가 불과 1도 높은 조건에서 해수면이 6.9m 높았던 앞선 간빙기의 되먹임 과정과 흡사해 산업화 이전 대비 2도 상승도 알려졌던 것보다 위험할 수 있다는 경보음을 울렸다. 과학자들은 다양한 컴퓨터 기후모델을 통해 미래의 기후변화를 예측해 알려주고 있다. 이런 모델링 결과를 종합해 기후변화정부간협의체는 이번 세기말인 2080~2100년에 지구 평균온도가 산업화 이전 대비 2도 증가하는 경우, 북극 생태계와 아마존에서 환경변화가 갑작스레 돌이킬 수 없는 상황으로 진행되는 이른바 '티핑 포인트' 도달, 육지의 탄소 흡수량 감소, 생물종 멸종 위험 증가, 해양 산성화와 높은 기후변화 속도에 따른 해양 생물 다양성 손실, 기후변화에 의한 작물 생산 변동성 증가, 질병률 증가 등의 위험이 중간 수준일 것으로 분류했다. 지구적 주요 위험 항목 15가지 가운데 매우 높은 수준의 위험으로 분류한 것은 '빈곤계층의 수자원 접근성 감소' 한 가지다. 하지만 모델링을 통한 미래 예측의 정확성에는 한계가 있다. 최근 북극의 바다 얼음 녹는 속도가 과거 어떤 모델링을 통해 예상했던 것보다도 빠르게 진행되고 있는 것이 그런 예다. 조금씩 가까워지는 2도 상승한 세상에 두려움을 가질 수밖에 없는 이유다. 환경정책평가연구원 기후융합연구실 강상인 연구위원은 "기후변화 피해가 산업화 이전 대비 상승 폭이 2도 미만으로 유지되면 다시 회복이 가능하지만, 2도를 넘어 점점 올라가면 다시 원래대로 되돌리기 어려운 불가역적 상황이 펼쳐진다는 우려가 있다"고 말했다. For other uses, see Jet stream (disambiguation). The polar jet stream can travel at speeds greater than 100 miles per hour (160 km/h). Here, the fastest winds are colored red; slower winds are blue. Clouds along a jet stream over Canada. Jet streams flow from west to east in the upper portion of the troposphere. Jet streams are caused by a combination of a planet's rotation on its axis and atmospheric heating (by solar radiation and, on some planets other than Earth, internal heat). Jet streams form near boundaries of adjacent air masses with significant differences in temperature, such as the polar region and the warmer air towards the equator. Other jet streams also exist. During the Northern Hemisphere summer, easterly jets can form in tropical regions, typically in a region where dry air encounters more humid air at high altitudes. Low-level jets also are typical of various regions such as the central United States. Meteorologists use the location of some of the jet streams as an aid in weather forecasting. The main commercial relevance of the jet streams is in air travel, as flight time can be dramatically affected by either flying with the flow or against the flow of a jet stream. Clear-air turbulence, a potential hazard to aircraft passenger safety, is often found in a jet stream's vicinity, but it does not create a substantial alteration on flight times. After the 1883 eruption of the Krakatoa volcano, weather watchers tracked and mapped the effects on the sky over several years. They labelled the phenomenon the "equatorial smoke stream". In the 1920s, a Japanese meteorologist, Wasaburo Oishi, detected the jet stream from a site near Mount Fuji. He tracked pilot balloons, also known as pibals (balloons used to determine upper level winds), as they rose into the atmosphere. Oishi's work largely went unnoticed outside Japan. American pilot Wiley Post, the first man to fly around the world solo in 1933, is often given some credit for discovery of jet streams. Post invented a pressurized suit that let him fly above 6,200 metres (20,300 ft). In the year before his death, Post made several attempts at a high-altitude transcontinental flight, and noticed that at times his ground speed greatly exceeded his air speed. German meteorologist Heinrich Seilkopf is credited with coining a special term, Strahlströmung (literally "jet streaming"), for the phenomenon in 1939. (Modern German usage is "Strahlstrom".) Many sources credit real understanding of the nature of jet streams to regular and repeated flight-path traversals during World War II. Flyers consistently noticed westerly tailwinds in excess of 100 mph (160 km/h) in flights, for example, from the US to the UK. Polar jet streams are typically located near the 250 hPa pressure level, or 7 to 12 kilometres (4.3 to 7.5 mi) above sea level, while the weaker subtropical jet streams are much higher, between 10 and 16 kilometres (6.2 and 9.9 mi) above sea level. In each hemisphere, both upper-level jet streams form near breaks in the tropopause, that is at a higher altitude near the equator than it is over the poles, with large changes in its height occurring near the location of the jet stream. The northern hemisphere polar jet stream is most commonly found between latitudes 30°N and 60°N, while the northern subtropical jet stream is located close to latitude 30°N. The upper level jet stream is said to "follow the sun" as it moves northward during the warm season, or late spring and summer, and southward during the cold season, or autumn and winter. The width of a jet stream is typically a few hundred kilometres or miles and its vertical thickness often less than five kilometres (3 mi). Meanders of the Northern Hemisphere's polar jet stream developing (a), (b); then finally detaching a "drop" of cold air (c). Orange: warmer masses of air; pink: jet stream. Jet streams are typically continuous over long distances, but discontinuities are common. The path of the jet typically has a meandering shape, and these meanders themselves propagate east, at lower speeds than that of the actual wind within the flow. Each large meander, or wave, within the jet stream is known as a Rossby wave. Rossby waves are caused by changes in the Coriolis effect with latitude. Shortwave troughs are smaller packets of upper level energy, on the scale of 1,000 to 4,000 kilometres (620–2,500 mi) long, that move through the flow pattern around large scale, or longwave, ridges and troughs within Rossby waves. Jet streams can split into two due to the formation of an upper-level closed low, that diverts a portion of the jet stream under its base, while the remainder of the jet moves by to its north. The wind speeds vary according to the temperature gradient, exceeding 92 km/h (50 kn; 57 mph), although speeds of over 398 km/h (215 kn; 247 mph) have been measured. Meteorologists now understand that the path of jet streams steers cyclonic storm systems at lower levels in the atmosphere, and so knowledge of their course has become an important part of weather forecasting. For example, in 2007 and 2012, Britain experienced severe flooding as a result of the polar jet staying south for the summer. The polar and subtropical jets merge at some locations and times, while at other times they are well separated. Highly idealised depiction of the global circulation. The upper-level jets tend to flow latitudinally along the cell boundaries. In general, winds are strongest immediately under the tropopause (except during tornadoes, hurricanes or other anomalous situations). If two air masses of different temperatures or densities meet, the resulting pressure difference caused by the density difference (which causes wind) is highest within the transition zone. The wind does not flow directly from the hot to the cold area, but is deflected by the Coriolis effect and flows along the boundary of the two air masses. All these facts are consequences of the thermal wind relation. The balance of forces on an atmospheric parcel in the vertical direction is primarily between the pressure gradient and the force of gravity, a balance referred to as hydrostatic. In the horizontal, the dominant balance outside of the tropics is between the Coriolis effect and the pressure gradient, a balance referred to as geostrophic. Given both hydrostatic and geostrophic balance, one can derive the thermal wind relation: the vertical gradient of the horizontal wind is proportional to the horizontal temperature gradient. This means that temperatures decreasing polewards implies that winds develop a larger eastward component as one moves upwards. Therefore, the strong eastward moving jet streams are in part a simple consequence of the fact that the equator is warmer than the north and south poles. The thermal wind relation does not explain why the winds are organized in tight jets, rather than distributed more broadly over the hemisphere. One factor that contributes to the sharpness of the polar jet is the undercutting of sub-tropical airmasses by the more dense polar airmasses at the polar front. This causes surface low pressure and higher pressure at altitude. At high altitudes, lack of friction allows air to respond freely to the steep pressure gradient with low pressure at high altitude over the pole. This results in the formation of planetary wind circulations that experience a strong Coriolis deflection and thus can be considered 'quasi-geostrophic'. The polar front jet stream is closely linked to the frontogenesis process in midlatitudes, as the acceleration/deceleration of the air flow induces areas of low/high pressure respectively, which link to the formation of cyclones and anticyclones along the polar front in a relatively narrow region. A second factor which contributes to jet sharpness is more appropriate for the subtropical jet, which forms at the poleward limit of the tropical Hadley cell and to first order this circulation is symmetric with respect to longitude. Tropical air rises to the tropopause, mainly because of thunderstorm systems in the Intertropical Convergence Zone, and moves poleward before sinking; this is the Hadley circulation. As it does so it tends to conserve angular momentum, since friction is slight above the ground. In the Northern Hemisphere motions are deflected to the right by the Coriolis force, which for poleward (northward) moving air implies an increased eastward component of the winds (note that leftward deflection in the southern hemisphere also leads to eastward motion). Around 30 degrees from the equator the jet wind speeds have become strong enough that were the jet to extend further polewards the increased windspeed would be unstable; thus the jet is limited. Jupiter's atmosphere has multiple jet streams, caused by the convection cells that form the familiar banded color structure; on Jupiter, these convection cells are driven by internal heating. The factors that control the number of jet streams in a planetary atmosphere is an active area of research in dynamical meteorology. In models, as one increases the planetary radius, holding all other parameters fixed, the number of jet streams increases. Note the large band of moisture that developed East of Hawaii Island that came from the hurricane. The jet stream is thought to be one of the reasons most of the Hawaiian Islands have been resistant to the long list of Hawaii hurricanes that have approached. For example, when Hurricane Flossie approached and dissipated just before reaching landfall, NOAA cited vertical wind shear as evidenced in the photo. On Earth, the northern polar jet stream is the most important one for aviation and weather forecasting, as it is much stronger and at a much lower altitude than the subtropical jet streams and also covers many countries in the Northern Hemisphere, while the southern polar jet stream mostly circles Antarctica and sometimes the southern tip of South America. The term jet stream in these contexts thus usually implies the northern polar jet stream. Flights between Tokyo and Los Angeles using the jet stream eastbound and a great circle route westbound. The location of the jet stream is extremely important for aviation. Commercial use of the jet stream began on 18 November 1952, when Pan Am flew from Tokyo to Honolulu at an altitude of 7,600 metres (24,900 ft). It cut the trip time by over one-third, from 18 to 11.5 hours. Not only does it cut time off the flight, it also nets fuel savings for the airline industry. Within North America, the time needed to fly east across the continent can be decreased by about 30 minutes if an airplane can fly with the jet stream, or increased by more than that amount if it must fly west against it. Associated with jet streams is a phenomenon known as clear-air turbulence (CAT), caused by vertical and horizontal wind shear connected to the jet streams. The CAT is strongest on the cold air side of the jet, next to and just underneath the axis of the jet. Clear-air turbulence can cause aircraft to plunge and so present a passenger safety hazard that has caused fatal accidents, such as the death of one passenger on United Airlines Flight 826 (1997). Scientists are investigating ways to harness the wind energy within the jet stream. According to one estimate, of the potential wind energy in the jet stream, only 1 percent would be needed to meet the world's current energy needs. The required technology would reportedly take 10–20 years to develop. There are two major scientific articles about jet stream power. Archer & Caldeira claim that the jet streams can generate the total power of 1700 TW, and that the climatic impact will be negligible. Miller, Gans, & Kleidon claim that the jet streams can generate the total power of only 7.5 TW, and that the climatic impact will be catastrophic. Near the end of World War II the Japanese fire balloon was designed as a cheap weapon intended to make use of the jet stream over the Pacific Ocean to reach the west coast of Canada and the United States. They were relatively ineffective as weapons, but they were used in one of the few attacks on North America during World War II, causing six deaths and a small amount of damage. The El Niño-Southern Oscillation (ENSO) influences the average location of upper-level jet streams, and leads to cyclical variations in precipitation and temperature across North America, as well as affecting tropical cyclone development across the eastern Pacific and Atlantic basins. Combined with the Pacific Decadal Oscillation, ENSO can also impact cold season rainfall in Europe. Changes in ENSO also change the location of the jet stream over South America, which partially affects precipitation distribution over the continent. During El Niño events, increased precipitation is expected in California due to a more southerly, zonal, storm track. During the El Niño portion of ENSO, increased precipitation falls along the Gulf coast and Southeast due to a stronger than normal, and more southerly, polar jet stream. Snowfall is greater than average across the southern Rockies and Sierra Nevada mountain range, and is well below normal across the Upper Midwest and Great Lakes states. The northern tier of the lower 48 exhibits above normal temperatures during the fall and winter, while the Gulf coast experiences below normal temperatures during the winter season. The subtropical jet stream across the deep tropics of the Northern Hemisphere is enhanced due to increased convection in the equatorial Pacific, which decreases tropical cyclogenesis within the Atlantic tropics below what is normal, and increases tropical cyclone activity across the eastern Pacific. In the Southern Hemisphere, the subtropical jet stream is displaced equatorward, or north, of its normal position, which diverts frontal systems and thunderstorm complexes from reaching central portions of the continent. Across North America during La Niña, increased precipitation is diverted into the Pacific Northwest due to a more northerly storm track and jet stream. The storm track shifts far enough northward to bring wetter than normal conditions (in the form of increased snowfall) to the Midwestern states, as well as hot and dry summers. Snowfall is above normal across the Pacific Northwest and western Great Lakes. Across the North Atlantic, the jet stream is stronger than normal, which directs stronger systems with increased precipitation towards Europe. Evidence suggests the jet stream was at least partially responsible for the widespread drought conditions during the 1930s Dust Bowl in the Midwest United States. Normally, the jet stream flows east over the Gulf of Mexico and turns northward pulling up moisture and dumping rain onto the Great Plains. During the Dust Bowl, the jet stream weakened and changed course traveling farther south than normal. This starved the Great Plains and other areas of the Midwest of rainfall, causing extraordinary drought conditions. Since 2007, and particularly in 2012 and early 2013, the jet stream has been at an abnormally low latitude across the UK, lying closer to the English Channel, around 50°N rather than its more usual north of Scotland latitude of around 60°N. However, between 1979 and 2001, it has been found that the average position of the jet stream has been moving northward at a rate of 2.01 kilometres (1.25 mi) per year across the Northern Hemisphere. Across North America, this type of change could lead to drier conditions across the southern tier of the United States and more frequent and more intense tropical cyclones in the tropics. A similar slow poleward drift was found when studying the Southern Hemisphere jet stream over the same time frame. The polar-night jet stream forms only during the winter months, i.e., polar nights, of the year in their respective hemispheres at around 60° latitude, but at a greater height than the polar jet, of about 80,000 feet (24,000 m). During these dark months the air high over the poles becomes much colder than the air over the equator. This difference in temperature gives rise to extreme air pressure differences in the stratosphere, which, when combined with the Coriolis effect, create the polar night jets, racing eastward at an altitude of about 30 miles (48 km). Inside the polar night jet is the polar vortex. The warmer air can only move along the edge of the polar vortex, but not enter it. Within the vortex, the cold polar air becomes cooler and cooler with neither warmer air from lower latitudes nor energy from the sun during the polar night. There are wind maxima at lower levels of the atmosphere that are also referred to as jets. A barrier jet in the low levels forms just upstream of mountain chains, with the mountains forcing the jet to be oriented parallel to the mountains. The mountain barrier increases the strength of the low level wind by 45 percent. In the North American Great Plains a southerly low-level jet helps fuel overnight thunderstorm activity during the warm season, normally in the form of mesoscale convective systems which form during the overnight hours. A similar phenomenon develops across Australia, which pulls moisture poleward from the Coral Sea towards cut-off lows which form mainly across southwestern portions of the continent. A valley exit jet is a strong, down-valley, elevated air current that emerges above the intersection of the valley and its adjacent plain. These winds frequently reach a maximum of 20 m/s (45 mph) at a height of 40-200 m above the ground. Surface winds below the jet may sway vegetation but are significantly weaker. They are likely to be found in valley regions that exhibit diurnal mountain wind systems, such as those of the dry mountain ranges of the US. Deep valleys that terminate abruptly at a plain are more impacted by these factors than are those that gradually become shallower as downvalley distance increases. The mid-level African easterly jet occurs during the Northern Hemisphere summer between 10°N and 20°N above West Africa, and the nocturnal poleward low-level jet occurs in the Great Plains of east and South Africa. The low-level easterly African jet stream is considered to play a crucial role in the southwest monsoon of Africa, and helps form the tropical waves which move across the tropical Atlantic and eastern Pacific oceans during the warm season. The formation of the thermal low over northern Africa leads to a low-level westerly jet stream from June into October. While other planets in Earth's solar system are either scorching hot or bitterly cold, Earth's surface has relatively mild, stable temperatures. Earth enjoys these temperatures because of its atmosphere, which is the thin layer of gases that cloak and protect the planet. However, 97 percent of climate scientists agree that humans have changed Earth's atmosphere in dramatic ways over the past two centuries, resulting in global warming. To understand global warming, it's first necessary to become familiar with the greenhouse effect, though. There's a delicate balancing act occurring every day all across the Earth, involving the radiation the planet receives from space and the radiation that's reflected back out to space. Earth is constantly bombarded with enormous amounts of radiation, primarily from the sun. This solar radiation strikes the Earth's atmosphere in the form of visible light, plus ultraviolet (UV), infrared (IR) and other types of radiation that are invisible to the human eye. UV radiation has a shorter wavelength and a higher energy level than visible light, while IR radiation has a longer wavelength and a weaker energy level. About 30 percent of the radiation striking Earth's atmosphere is immediately reflected back out to space by clouds, ice, snow, sand and other reflective surfaces, according to NASA. 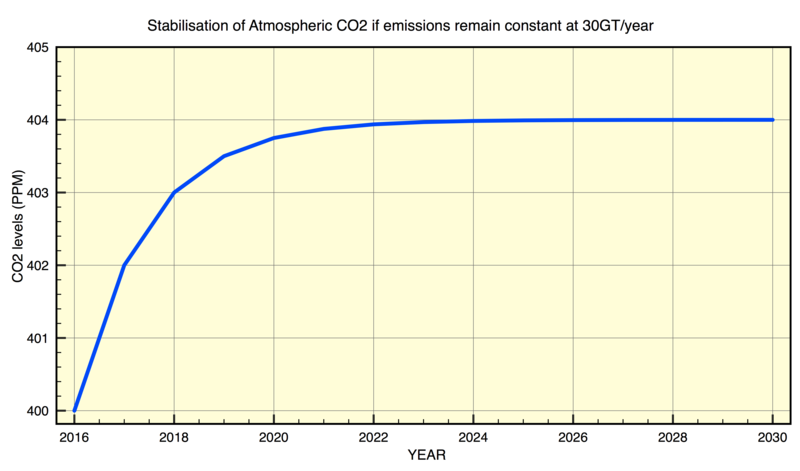 The remaining 70 percent of incoming solar radiation is absorbed by the oceans, the land and the atmosphere. As they heat up, the oceans, land and atmosphere release heat in the form of IR thermal radiation, which passes out of the atmosphere and into space. It's this equilibrium of incoming and outgoing radiation that makes the Earth habitable, with an average temperature of about 59 degrees Fahrenheit (15 degrees Celsius), according to NASA. Without this atmospheric equilibrium, Earth would be as cold and lifeless as its moon, or as blazing hot as Venus. The moon, which has almost no atmosphere, is about minus 243 F (minus 153 C) on its dark side. Venus, on the other hand, has a very dense atmosphere that traps solar radiation; the average temperature on Venus is about 864 F (462 C). The exchange of incoming and outgoing radiation that warms the Earth is often referred to as the greenhouse effect because a greenhouse works in much the same way. Incoming UV radiation easily passes through the glass walls of a greenhouse and is absorbed by the plants and hard surfaces inside. Weaker IR radiation, however, has difficulty passing through the glass walls and is trapped inside, thus warming the greenhouse. This effect lets tropical plants thrive inside a greenhouse, even during a cold winter. A similar phenomenon takes place in a car parked outside on a cold, sunny day. Incoming solar radiation warms the car's interior, but outgoing thermal radiation is trapped inside the car's closed windows. "Gas molecules that absorb thermal infrared radiation, and are in significant enough quantity, can force the climate system. These type of gas molecules are called greenhouse gases," Michael Daley, an associate professor of Environmental Science at Lasell College told Live Science. Carbon dioxide (CO2) and other greenhouse gases act like a blanket, absorbing IR radiation and preventing it from escaping into outer space. The net effect is the gradual heating of Earth's atmosphere and surface, a process known as global warming. These greenhouse gases include water vapor, CO2, methane, nitrous oxide (N2O) and other gases, according to the Environmental Protection Agency (EPA). Since the dawn of the Industrial Revolution in the early 1800s, the burning of fossil fuels like coal, oil and gasoline have greatly increased the concentration of greenhouse gases in the atmosphere, especially CO2, National Oceanic and Atmospheric Administration (NOAA). "Deforestation is the second largest anthropogenic source of carbon dioxide to the atmosphere ranging between 6 percent and 17 percent," said Daley. 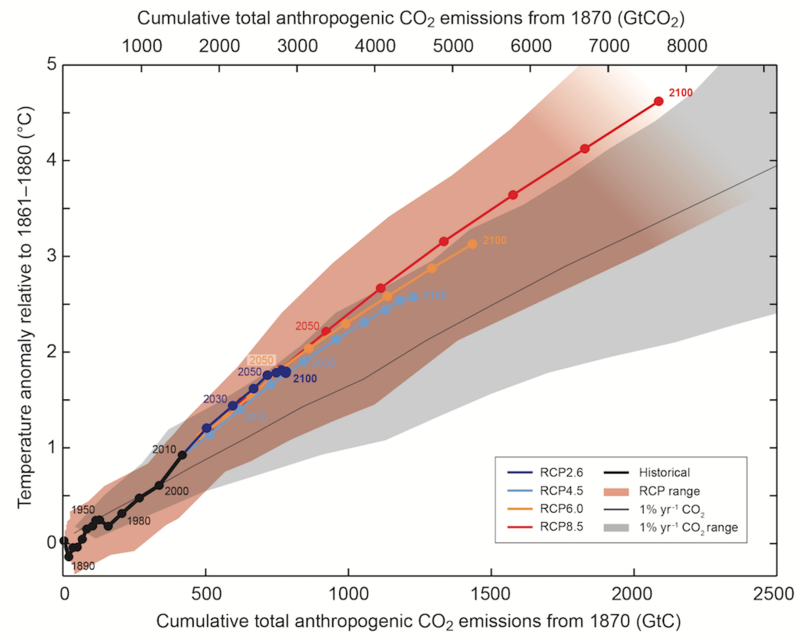 Atmospheric CO2 levels have increased by more than 40 percent since the beginning of the Industrial Revolution, from about 280 parts per million (ppm) in the 1800s to 400 ppm today. The last time Earth's atmospheric levels of CO2 reached 400 ppm was during the Pliocene Epoch, between 5 million and 3 million years ago, according to the University of California, San Diego's Scripps Institution of Oceanography. The greenhouse effect, combined with increasing levels of greenhouse gases and the resulting global warming, is expected to have profound implications, according to the near-universal consensus of scientists. If global warming continues unchecked, it will cause significant climate change, a rise in sea levels, increasing ocean acidification, extreme weather events and other severe natural and societal impacts, according to NASA, the EPA and other scientific and governmental bodies. Can the greenhouse effect be reversed? Do nothing and live with the consequences. Adapt to the changing climate (which includes things like rising sea level and related flooding). 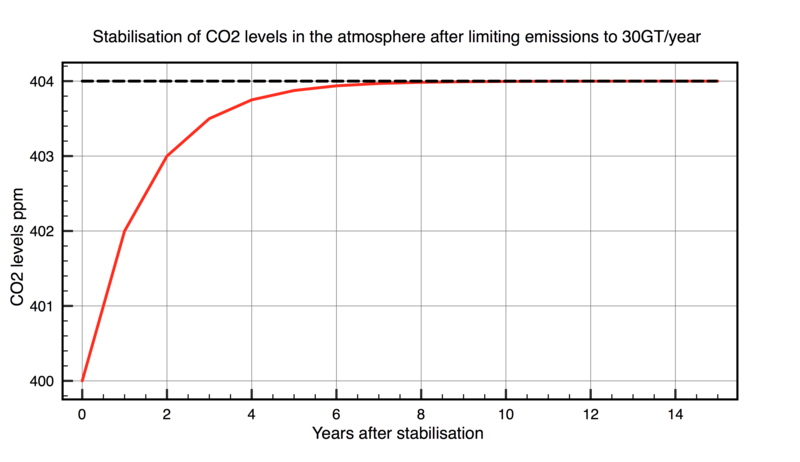 Mitigate the impact of climate change by aggressively enacting policies that actually reduce the concentration of CO2 in the atmosphere. Keith Peterman, a professor of chemistry at York College of Pennsylvania, and Gregory Foy, an associate professor of chemistry at York College of Pennsylvania believes that the damage isn't to that point yet, and that international agreements and action can save the planet's atmosphere.